Thursday September 15- 1932. I was home all day. I worked some on the dress Laura gave me. Winnie had a little ride with Mrs Gay while I was asleep in PM. Hattie here for supper and went out to Dr Lemons later Weather fine Friday September 16- 1932. I did some cleaning in AM. Soon after dinner Mrs Gay took us up to The Burckle Hotel. We called on Laura [Mahona] and I went up to see Mrs [Wullweber]. I came home in the bus and Winnie walked home. Saturday September 17- 1932. Mary came and took me up town. I went to the bake sale for our SS class to get some things I sewed some in PM wrote Laura & Edith in evening Cora here in AM a few moments and Hattie in PM Sunday September 18- 1932. Ott took us up to S.S & church. dinner here at home. I figured up my loss on investments and found it perfectly appaling. I wrote Alma [Wering?] and sent birth day greeting to H D. Rowe. Monday September 19- 1932. I did some washing and other work. I took a long sleep in the afternoon. 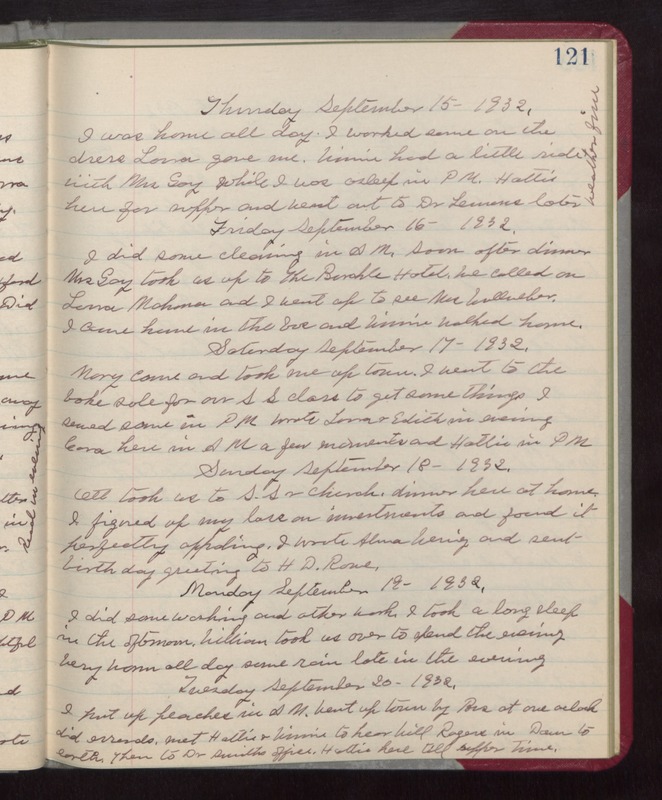 William took us over to spend the evening Very warm all day some rain late in the evening Tuesday September 20- 1932. I put up peaches in AM. Went up town by Bus at one oclock did errands. met Hattie & Winnie to hear Will Rogers in Down to earth. Then to Dr Smiths office. Hattie here till supper time.